Robin Youngs, Edward Fisher,	The Journal of Laryngology & Otology, Volume 129 Issue 12, p 1147. 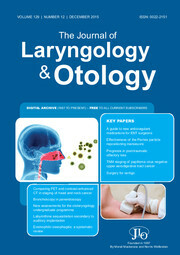 U Aydil, U Duvvuri, Y Kizil, A Köybaşioğlu,	The Journal of Laryngology & Otology, Volume 129 Issue 12, pp 1148-1155. M Bahgat, N Dawe, L Flood,	The Journal of Laryngology & Otology, Volume 129 Issue 12, pp 1156-1166. M Bajalan, T C Biggs, S Jayaram, J Mainwaring, R Salib,	The Journal of Laryngology & Otology, Volume 129 Issue 12, pp 1167-1173. N Wooles, M Mulheran, P Bray, M Brewster, A R Banerjee,	The Journal of Laryngology & Otology, Volume 129 Issue 12, pp 1174-1181. U Patnaik, A Srivastava, K Sikka, A Thakar,	The Journal of Laryngology & Otology, Volume 129 Issue 12, pp 1182-1187. B L Kinne, J S Leafman,	The Journal of Laryngology & Otology, Volume 129 Issue 12, pp 1188-1193. T Taruya, S Takeno, K Kubota, A Sasaki, T Ishino, K Hirakawa,	The Journal of Laryngology & Otology, Volume 129 Issue 12, pp 1194-1200. C-L Kuo, C-H Shu,	The Journal of Laryngology & Otology, Volume 129 Issue 12, pp 1201-1207. S Sengul, İ Kaygusuz, M M Akin, Ş Yalcin, T Karlidag, E Keles, İ Arslan,	The Journal of Laryngology & Otology, Volume 129 Issue 12, pp 1208-1212. J R Qualliotine, W K Mydlarz, J YK Chan, X Zhou, H Wang, N Agrawal,	The Journal of Laryngology & Otology, Volume 129 Issue 12, pp 1213-1219. A Shahangian, E J Damrose,	The Journal of Laryngology & Otology, Volume 129 Issue 12, pp 1220-1223. S Arslan, B Çobanoğlu, A Ural, İ Sayğin, A Ü Işik,	The Journal of Laryngology & Otology, Volume 129 Issue 12, pp 1224-1227. R Woods, T Subramaniam, A Patterson, M Hennessy, C Timon,	The Journal of Laryngology & Otology, Volume 129 Issue 12, pp 1228-1233. C J Butterworth, J Lancaster, H S Shah,	The Journal of Laryngology & Otology, Volume 129 Issue 12, pp 1234-1237. E Warner, N Eze, S Connor, D Jiang,	The Journal of Laryngology & Otology, Volume 129 Issue 12, pp 1238-1242. Y Brand, E Lim, V Waran, N Prepageran,	The Journal of Laryngology & Otology, Volume 129 Issue 12, pp 1243-1247. F Sipaul, B Ling, C Mason, A Keast,	The Journal of Laryngology & Otology, Volume 129 Issue 12, pp 1248-1250. S S Bakshi,	The Journal of Laryngology & Otology, Volume 129 Issue 12, p 1251. S S Bakshi,	The Journal of Laryngology & Otology, Volume 129 Issue 12, p 1253. A Yenigun,	The Journal of Laryngology & Otology, Volume 129 Issue 12, pp 1251-1252. L O Egwari,	The Journal of Laryngology & Otology, Volume 129 Issue 12, pp 1253-1254. M M C Yaneza, H L James, P Davies, S Harrison, L Mcalorum, W A Clement, H Kubba,	The Journal of Laryngology & Otology, Volume 129 Issue 12, p 1256. Zaid Awad, Richard Williams, Natalie Ronan, S A Hickey, H Khalil, A Evans, T Jones, D Skinner, B N Kumar, J Rainsbury, A Narula, J Powles,	The Journal of Laryngology & Otology, Volume 129 Issue 12, pp -.